Pomigliano d’Arco (Italy) (AFP) – Rapturous applause welcomed Luigi Di Maio, the charismatic leader of Italy’s triumphant anti-establishment Five Star Movement, in his hometown on Tuesday, even as supporters pondered how the party could come to power. Hundreds cheered Di Maio in Pomigliano d’Arco, an industrial town near Naples, as the beaming 31-year-old stepped on the stage under the rain. “We have made history,” Di Maio told the crowd after his party scooped up almost 33 percent of the vote to become Italy’s single biggest party, although it fell short of an overall majority to be able to form a government. 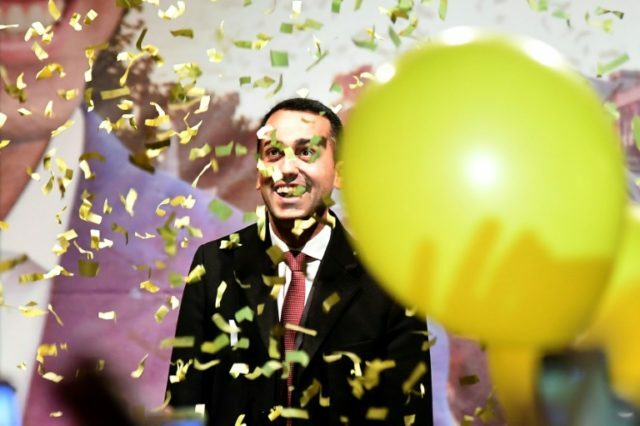 In Pomigliano, where the party won 65 percent of the vote in Sunday’s election, Di Maio was greeted with a sea of yellow balloons — the colour of the Five Star Movement. “We won this election, we are the absolute winners,” he said. But the maverick party, which only entered parliament for the first time in 2013, would need the support of other parties in order to be able to govern. The issues is sensitive though — any perception of cosy deals with other parties risks alienating its core support from Italians angered by traditional politics. “They have to make alliances to be able to govern,” said Arleta Fabricatore a 45-year old teacher. The movement has called for a universal basic income scheme, a cut in income tax, a raise in pensions and a programme to slash Italy’s infamous red tape for businesses. Two scenarios outlined in recent days are a deal with the centre-left Democratic Party (PD) or with the far-right anti-immigration League party, which came out top in a right-wing alliance that won 37 percent of the vote. “It’s a complex issue,” said office worker Luca Carosella, 38. Carmine Petito, a 70-year-old pensioner said: “The PD is the only option”. He ruled out a deal with 81-year-old former prime minister Silvio Berlusconi, a member of the right-wing alliance, calling him “an old has-been”. “There would be some common ground with Salvini, but who would take the leading role?” Petito said. An alliance remains a controversial issue for the party’s core supporters though. “We need to be clear about one thing,” said Carosella. “Even if they enter into a majority government with another political party, it would absolutely not be an alliance.